Climate change risk assessment can help organisations identify their climate change related risks or to test their existing risk management strategies under climate change and therefore identify areas where new strategies are needed. A first-pass risk screening allows users to conduct a desk-top study and screen their climate change-related exposure using readily available datasets. It provides guidance on whether a more detailed second- or third-level assessment is required. A second-pass risk assessment takes a standard risk-based approach using national data, local information and expert knowledge. It supports the user to identify how climate change may compound existing risks or create new ones, and advises on whether a more detailed third-level assessment is required. A third-pass (detailed) risk assessment process allows users to further investigate short-listed risks and provides support to prioritise strategies and action. For each level, CoastAdapt provides guidance on how to conduct the risk assessment as well as simple spreadsheet-based tools to record information and conduct risk workshops with stakeholders. CoastAdapt provides a searchable database of tools and relevant information to support the risk assessment process. Why should climate change risks be assessed? Climate change risk assessment can assist organisations to identify their climate change-related risks or to test the relevance of their existing risk management strategies under climate change to help identify areas where new strategies are warranted. Recent observations confirm that our climate is changing and causing temperatures and sea levels to rise (Observed climate and sea level change, Long-term changes). Scientific analyses suggest that even if the world adopts strong future climate change mitigation measures, a further change in future climate and sea level is inevitable (Global climate change). Therefore, the assumption that existing risk management strategies will suffice under the future climate change can be problematic. Hazard: In the context of climate change, hazard refers to any potential occurrence of a natural or human-induced physical event that may cause damage to property, infrastructure, livelihoods, service provision, environmental resources etc. As an example, as sea level rises, increased frequency of inundation of an area during storm event is a potential hazard for a low lying coastal community. Risk: Risk is the potential for consequences where something of value is at stake and where the outcome is uncertain, recognizing the diversity of values. Risk is often represented as probability of occurrence of hazardous events (likelihood) or trends multiplied by the impacts (or consequences) if these events or trends occur. 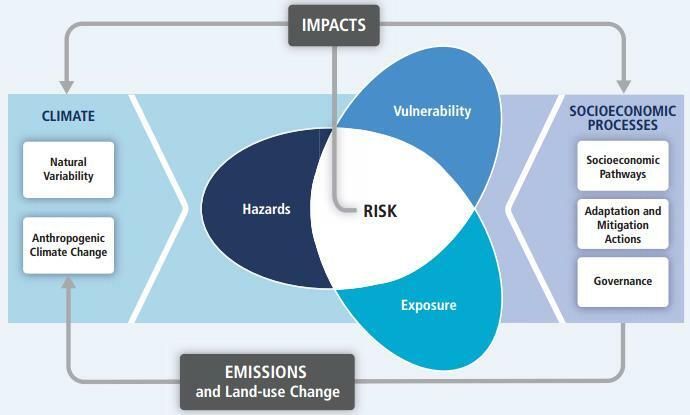 Risk results from the interaction of vulnerability, exposure, and hazard (IPCC 2014). See Figure 1. As an example, as sea level rises, increased frequency (likelihood) of inundation (a hazard) of an area during storm event can put the structural integrity of a nearby infrastructure, such as road into a risk. Vulnerability: The propensity or predisposition to be adversely affected. Vulnerability encompasses a variety of concepts and elements including sensitivity or susceptibility to harm and lack of capacity to cope and adapt (IPCC 2014). As an example, older populations are more sensitive to heat-stress and have limited physical capacity to adapt, therefore highly vulnerable during a heatwave. Exposure: The term exposure refers to the degree to which a system is exposed to a given hazard (e.g. sea-level rise). As an example, a coastal community in a low-lying area can be exposed to certain degree of hazard of inundation during a storm event. Sensitivity: In the context of a risk assessment, the term sensitivity refers to the degree to which a system is affected by, or responsive to a hazard. In other words, sensitivity captures the potential of a system to be impacted by a hazard. Sometimes sensitivity is determined by the criticality of the service that the system provides. For example, a community uses a road located close to the low-lying area of the coast as its main access to a major hospital. In the past, this road has been inundated during a storm event making access to the hospital difficult. Because the hospital provides such an essential service, this community should be considered more sensitive to coastal inundation event. Adaptive capacity: Adaptive capacity of a system describes its ability to adjust to climate change (including climate variability and extremes) to moderate potential damages, to take advantage of opportunities, or to cope with the consequences (IPCC 2014). Figure 1: Illustration of the fundamental concept of risk and vulnerability to climate change. Source: IPCC 2014 (Fifth Assessment Report, Working Group 2, Chapter 19, Figure 19-1). A first-pass risk screening provides a straightforward low-cost screening of exposure to climate change risk based on readily-available data, or expert opinion, to determine whether more detailed assessment may be required, to seek a social and organisation licence to act on adaptation and to appropriately frame your adaptation approach (ideal for resource-constrained organisations with limited data and information). A second-pass risk assessment takes a standard risk-based approach similar to standards like AS/NZS-ISO31000:2009 (Standards Australia and Standards New Zealand 2009) and AS5334 (Standards Australia 2013), using national data and locally available information and expert knowledge to identify how climate change may increase existing risks or create new ones. This helps to prioritise areas where action may be required. It generates a risk register that can be used to identify adaptation options and opportunities. A third-pass (detailed) risk assessment allows further investigation of prioritized and short-listed risks. It can be used to underpin adaptation actions for which more detailed knowledge, data and information are required to act effectively. This can support a Pathways approach in which thresholds are defined (when the risk will cross a defined tolerable limit), at which point some action is required. It allows understanding of the extent of impacts from climate change. Neither of these are possible with a first- or second-pass risk assessment. Figure 3 and Figure 4 summarise key aspects of these different types of risk assessments. Table 1 describes when each type of assessment should be used, what outcomes may be expected, and how these can be applied to adaptation planning. C-CADS (Coastal Climate Adaptation Decision Support), is the decision support tool of CoastAdapt, supporting coastal managers to make effective adaptation decisions. 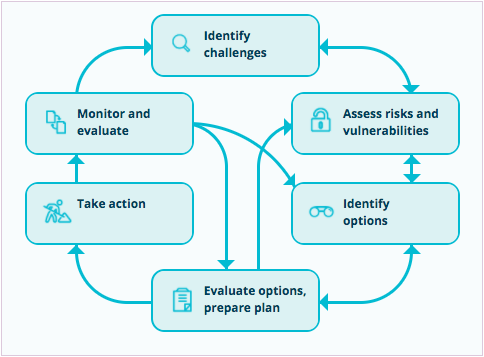 As shown in Figure 2, it takes users through six steps to fully identify risks, establish actions to address these risks, take action and monitor the outcomes. Risk assessment, as described here, addresses just the first two of these six steps, termed in C-CADS as ‘Identify Challenges’ and ‘Assess risks and vulnerabilities’. Figure 2: Climate change risk assessment under the C-CADS framework. The figure shows the six steps of C-CADS. Risk assessment is relevant for the first two steps (shaded in red). A first-pass screening is used in ‘Identify challenges’ whereas more detailed second and third-pass assessments are used in ‘Assess risks and vulnerabilities’. Source: © NCCARF 2016. Figure 3: Four fundamental steps of a risk assessment process. Source: © NCCARF 2016. Figure 4: Objective of the three levels of risk assessment in CoastAdapt. Source: © NCCARF 2016. Figure 5: Resource requirements of the three levels of risk assessment in CoastAdapt. Source: ©NCCARF 2016. Table 1: Recommended context for conducting different types of risk assessments and potential use of their outcomes in adaptation planning. The core of the risk assessment process is based on the four steps shown in Figure 2. These four steps are followed in each of the three levels of risk assessment, but with increasing depth and different types of analysis. Table 2 shows a general overview of these four steps for the three levels of assessment. These are discussed in further detail in each guidance document (see below). Please note that these guidelines cover only the risk assessment part of a risk management framework. Guidelines for managing identified risks are available through C-CADS. CoastAdapt provides a review and a searchable database of national and international adaptation support tools, including tools which can support your risk assessment (Catalogue of adaptation support tools). In addition, CoastAdapt provides simple tools to support your risk assessment process. These are spreadsheets that you can use along with the guidance material to record information and conduct risk workshops with your stakeholders (Risk assessment templates). Table 2: Summary overview of the three levels of risk assessment in CoastAdapt. AGO (Australian Greenhouse Office), 2006: Climate change impacts and risk management: A guide for business and government. Prepared for the Australian Greenhouse Office, Department of Environment and Heritage by Broadleaf Capital International and Marsden Jacob Associates. Accessed 15 June 2016. [Available online at https://www.environment.gov.au/system/files/resources/21c04298-db93-47a6-a6b0-eaaaae9ef8e4/files/risk-management.pdf]. NSW Office of Environment and Heritage, 2011: Guide to climate change risk assessment for NSW local government. Accessed 15 June 2016. [Available online at https://www.google.com.au/url?sa=t&rct=j&q=&esrc=s&source=web&cd=1&ved=0ahUKEwitwr3E16nNAhUQA1IKHctCAcoQFggdMAA&url=http%3A%2F%2Fwww.climatechange.environment.nsw.gov.au%2F~%2Fmedia%2FCB26EC0A30844A318E33A243FA8CA283.ashx&usg=AFQjCNHuz0m0OvWTYgod8j2QzH_U_Lxm3w&sig2=4jreuMvzH6tiXmGiXt8Bwg]. IPCC, 2014: Climate Change 2014: Impacts, Adaptation, and Vulnerability. Part A: Global and Sectoral Aspects. Contribution of Working Group II to the Fifth Assessment Report of the Intergovernmental Panel on Climate Change, Field, C.B., V.R. Barros, D.J. Dokken, K.J. Mach, M.D. Mastrandrea, T.E. Bilir, M. Chatterjee, K.L. Ebi, Y.O. Estrada, R.C. Genova, B. Girma, E.S. Kissel, A.N. Levy, S. MacCracken, P.R. Mastrandrea, and L.L. White, Eds., Cambridge, United Kingdom and New York, NY, USA: Cambridge University Press. Accessed 15 June 2016. [Available online at https://www.ipcc.ch/pdf/assessment-report/ar5/wg2/WGIIAR5-FrontMatterA_FINAL.pdf]. Standards Australia, 2013: AS5334: Australian Standard for Climate Change Adaptation for settlements and infrastructure – A risk based approach. Standards Australia Limited, Sydney, Australia. Standards Australia, and Standards New Zealand, 2009: AS/NZS-ISO31000: Risk Management Principles and Guidelines. Standards Australia International.